Yesterday we colored Easter eggs. My daughter came over with my 2 granddaughters and 2 dozen hard-boiled eggs. We used packages of Kool-Aid mixed with a half cup of water and a half cup of vinegar. It's a good thing I buy vinegar at Sam's Club...so there's usually more than a gallon in the house at all times. Since we usually buy the Paas Easter Egg dye, this was a new experience for us and we weren't even sure it would work. We covered the table with newspaper and got out the crayons. We made decorations with the crayons on the eggs and dipped them in the Kool-Aid mixture. 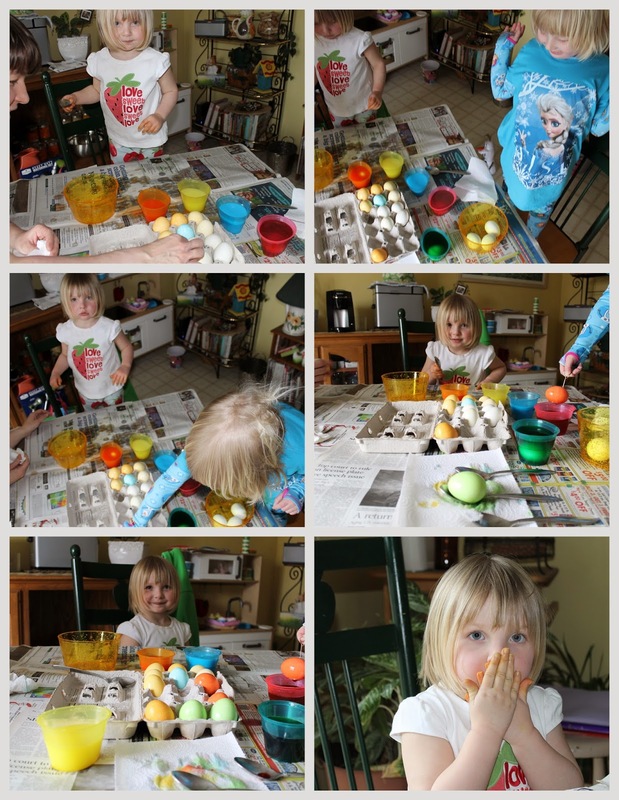 Avery, who is 2 decided that the best way to get the eggs nice and coated with the dye was to use her hands. So she twirled those eggs around in the dye until she was happy with the results. It did stain her hands a little, no big deal. It was a comfort knowing she was dipping her hands in a products that were all totally edible...icky tasting but still edible which meant it was safely non-toxic. The Kool-Aid worked. Of course the longer the egg soaked in the dye, the deeper the color of the egg. Chloe, who is 5 had much more patience and let the eggs sit in the dye much longer than her little sister. The girls each had a dozen eggs to work with and they enjoyed coloring every single one of them.